It goes without saying that winter in New Jersey can be tough. Everyone’s accessibility shifts — the icy roads and snowy sidewalks make it difficult for cars and pedestrians to navigate their way through the season. For people with different mobility needs, winter can be an infinitely more challenging time. As we’ve discussed in our ADA compliance blogs, your business is responsible for being accessible to all. In the winter, this means taking extra steps to ensure everyone can have a safe experience while interacting with your business. Coworkers, employees, clients, customers — there are countless people who come through your doors, and every mobility need should be addressed, especially in winter. 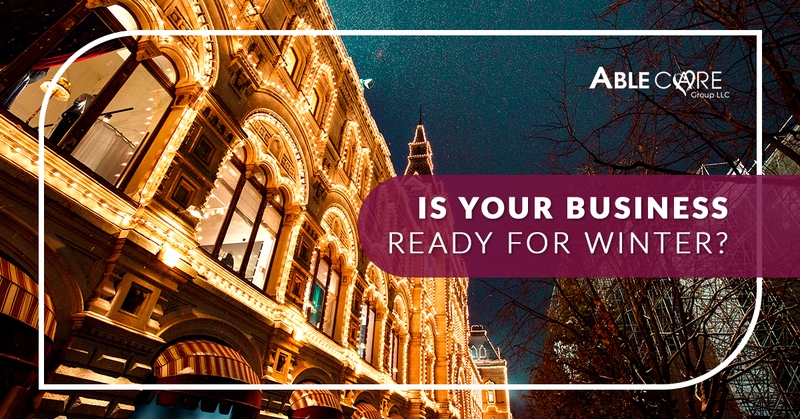 Take a look at our winter business preparation checklist, and remember what your answers are as you go through. If you find yourself in need of a wheelchair ramp, vertical platform lift, or elevator for your business, Able Care Group can help. Contact us online or give us a call to get started! We serve New York and New Jersey and would be honored to work with you. Did you get your HVAC checked? The last thing you want as a business owner is to lose money and lose business. Nothing will make that happen faster than being without heat in the middle of January. Because if you wouldn’t want to eat a plate of pasta bolognese in an Italian restaurant with chattering teeth and eight different layers and gloves on, your customers probably feel the same. Call your local HVAC specialist to make sure your heating system and air ducts are set for winter. Not only does this help your business stay warm, cozy, and inviting, but it also can save you money — inefficient heating systems lead to higher energy bills. Do you have your shoveling gear? Sidewalks, wheelchair ramps, and steps that lead up to your business need to be properly cleared and salted. A shovel, as well as a scraper with a brush attached is good to have on hand as well. This allows you to not only get rid of snow and ice and to keep pathways clear, but to also clear off handrails so that they’re easier to grab and use. As always, make sure you respond as quickly as possible to winter storms so that people aren’t in peril when going by or going to your business. Are your floors prepared for slush? Anyone can slip on a wet floor, but those who are elderly or have problems balancing independently could be more at risk for serious injury. Just as you prepare your outdoor space and clear it of the snow, you have to be ready for patrons and employees alike to track in the outdoor slush, making your floor slippery and hazardous. Invest in some heavy-duty industrial mats to line your entryways, and put out caution signs as necessary. Are your business’ signs still readable? Bigger signs that get covered by snow can limit visibility, which can lead to people having a hard time finding your business. Additionally, Braille signs that indicate your business’ address or name are likely going to disappear after a snowstorm. Have a system in place for quick and efficient snow removal so that everyone can access and locate your business. Is your outdoor technology set for colder temps? Vertical platform lifts, automatic door opening buttons — with the wrong technology and the right weather conditions, freezing or malfunctioning technology can happen with ease. However, if you invest in outdoor technology from a mobility solutions team like Able Care Group, you can rest assured that you’re getting only the best products on the market. With wheelchair ramps, outdoor vertical platform lifts, or stairlifts, your business can survive and thrive this winter, and people will thank you for it. If you answered “yes” to all of these questions, your business is pretty well-prepared for winter! If there are some things you still need to do, it’s OK — it’s better late than never to make your business more accessible for all, regardless of the season. Give our team at Able Care Group a call to get started and see what we can do for you. We look forward to hearing from you and doing what we can to help!